New Universal Burgundy Carpet Car Floor Mats 4 Pcs Set for Cars Trucks SUVS With Burgundy Heel Pad -Front and Rear Mats by PRC at Lazaranda Dallas. MPN: BUR-CPFM. Hurry! Limited time offer. Offer valid only while supplies last. New Universal Burgundy Carpet Car Floor Mats 4 Pcs Set for Cars Trucks SUVS Vans Heel Pad Universal Carpet floor mats designed to fit most vehicles. New Universal Burgundy Carpet Car Floor Mats 4 Pcs Set for Cars Trucks SUVS Vans Heel Pad Universal Carpet floor mats designed to fit most vehicles. •Floor Mats have rubber backing with nibs to help floor mat stay in place. •Color Matching Vinyl heel pad. •Please Note that these floor mats are universal and not intended to fit any vehicles exact dimensions. •Floor Mat Dimensions: Front Mats: 25"x16.5" & Rear Mats: 11.5"x16.5". We recommend using these dimensions to see if the floor mats are a good fit for your specific vehicle. •Four Pieces total: 2 Front Carpet floor mats and two rear carpet floor mats. 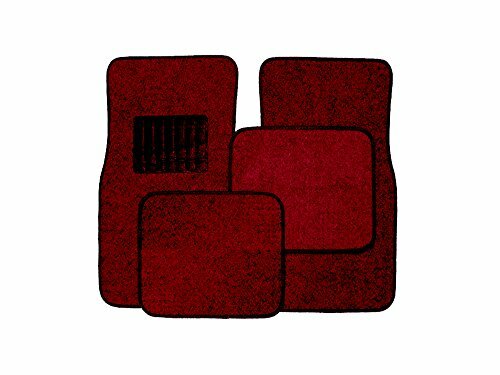 Universal Burgundy Carpet floor mats designed to fit most vehicles. Floor Mats have rubber backing with nibs to help floor mat stay in place. Color Matching Vinyl heel pad. Floor Mat Dimensions: Front Mats: 25"x16.5" & Rear Mats: 11.5"x16.5". We recommend using these dimensions to see if the floor mats are a good fit for your specific vehicle. If you have any questions about this product by PRC, contact us by completing and submitting the form below. If you are looking for a specif part number, please include it with your message.